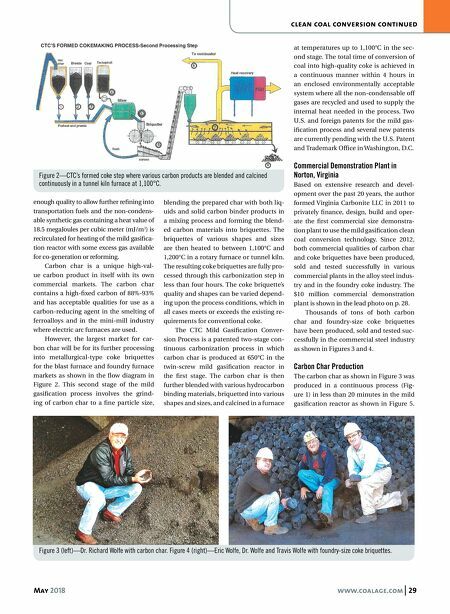 May 2018 www.coalage.com 29 clean coal conversion continued enough quality to allow further refining into transportation fuels and the non-condens- able synthetic gas containing a heat value of 18.5 megaJoules per cubic meter (mJ/m 3 ) is recirculated for heating of the mild gasifica- tion reactor with some excess gas available for co-generation or reforming. Carbon char is a unique high-val- ue carbon product in itself with its own commercial markets. The carbon char contains a high-fixed carbon of 88%-93% and has acceptable qualities for use as a carbon-reducing agent in the smelting of ferroalloys and in the mini-mill industry where electric arc furnaces are used. However, the largest market for car- bon char will be for its further processing into metallurgical-type coke briquettes for the blast furnace and foundry furnace markets as shown in the flow diagram in Figure 2. This second stage of the mild gasification process involves the grind- ing of carbon char to a fine particle size, blending the prepared char with both liq- uids and solid carbon binder products in a mixing process and forming the blend- ed carbon materials into briquettes. The briquettes of various shapes and sizes are then heated to between 1,100°C and 1,200°C in a rotary furnace or tunnel kiln. The resulting coke briquettes are fully pro- cessed through this carbonization step in less than four hours. The coke briquette's quality and shapes can be varied depend- ing upon the process conditions, which in all cases meets or exceeds the existing re- quirements for conventional coke. 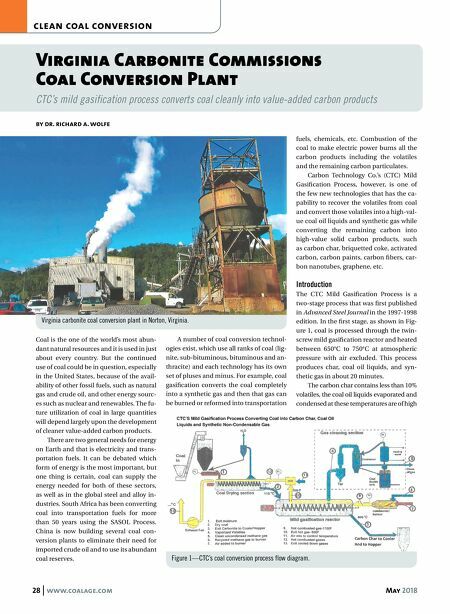 The CTC Mild Gasification Conver- sion Process is a patented two-stage con- tinuous carbonization process in which carbon char is produced at 650°C in the twin-screw mild gasification reactor in the first stage. The carbon char is then further blended with various hydrocarbon binding materials, briquetted into various shapes and sizes, and calcined in a furnace at temperatures up to 1,100°C in the sec- ond stage. The total time of conversion of coal into high-quality coke is achieved in a continuous manner within 4 hours in an enclosed environmentally acceptable system where all the non-condensable off gases are recycled and used to supply the internal heat needed in the process. Two U.S. and foreign patents for the mild gas- ification process and several new patents are currently pending with the U.S. Patent and Trademark Office in Washington, D.C. Commercial Demonstration Plant in Norton, Virginia Based on extensive research and devel- opment over the past 20 years, the author formed Virginia Carbonite LLC in 2011 to privately finance, design, build and oper- ate the first commercial size demonstra- tion plant to use the mild gasification clean coal conversion technology. Since 2012, both commercial qualities of carbon char and coke briquettes have been produced, sold and tested successfully in various commercial plants in the alloy steel indus- try and in the foundry coke industry. The $10 million commercial demonstration plant is shown in the lead photo on p. 28. Thousands of tons of both carbon char and foundry-size coke briquettes have been produced, sold and tested suc- cessfully in the commercial steel industry as shown in Figures 3 and 4. Carbon Char Production The carbon char as shown in Figure 3 was produced in a continuous process (Fig- ure 1) in less than 20 minutes in the mild gasification reactor as shown in Figure 5. Figure 2—CTC's formed coke step where various carbon products are blended and calcined continuously in a tunnel kiln furnace at 1,100°C. Figure 3 (left)—Dr. Richard Wolfe with carbon char. Figure 4 (right)—Eric Wolfe, Dr. Wolfe and Travis Wolfe with foundry-size coke briquettes.